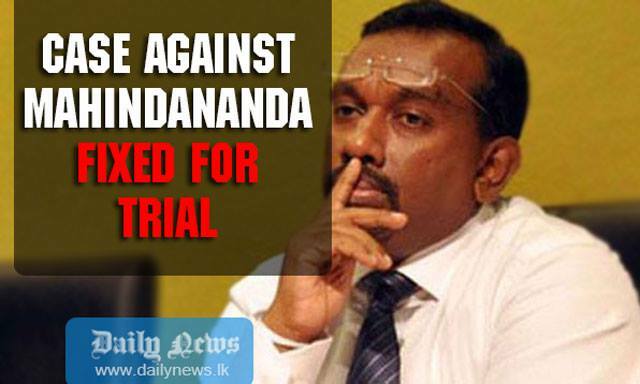 A case filed alleging former Sports Minister Mahindananda Aluthgamage to have purchased a house worth Rs.27 million at Kynsey Road, Colombo 7 through illegally acquired money was fixed for trial at the Colombo High Court, today. When MP Aluthgamage appeared before Colombo High Court Judge Gihan Kulatunga, he was informed that the accused has fulfilled his bail conditions. Accordingly, the case was fixed for trial on November 20 and 21. The Attorney General filed indictments against Mahindananda Aluthgamage alleging that Aluthgamagehad purchased a house at Kynsey Road, Colombo 7 from an individual named Christopher Roshan for Rs.27 million. The Attorney General alleged that the accused has failed to disclose how he was able to raise the money for the purchase of the house and further alleged that he had committed an offence that comes under section 3 and 4 of the Prevention of Money Laundering Act. This case will be taken up again on July 10. Deputy Solicitor General Thusith Mudalige appeared for the Attorney General. Counsel Niroshan Siriwardena and Indika Giragama appeared on behalf of the accused.